The Battle of the Bulge, one of the largest battles in the largest war in world history, produced thousands of prisoners. 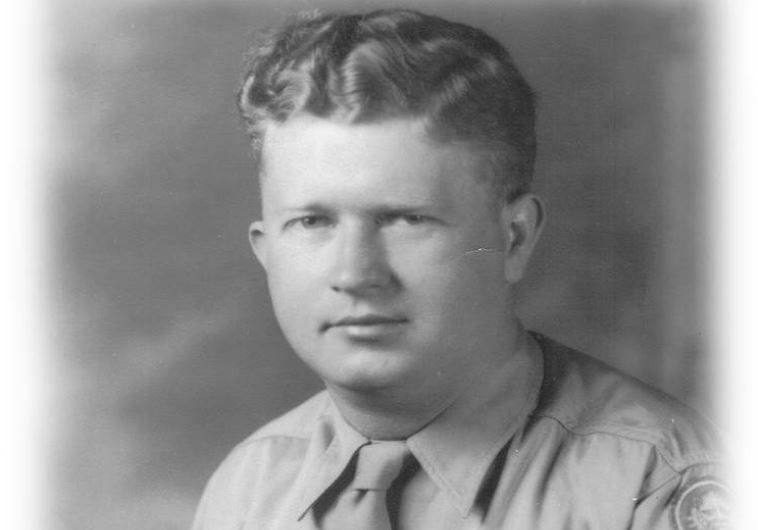 Among the prisoners in the Stalag IXA camp were about one thousand men of the U.S. 422nd Infantry Regiment, who found themselves under the command of Master Sergeant Roddie Edmonds – a non-com, but still the regiment’s most senior surviving member. Last year, his son, Rev. Chris Edmonds, had his first full opportunity to share his father’s story with the world – by dumb luck, just a month too late for his father to participate in last year’s Al Copeland Humanitarian of the Year Award process. But The Al has a long memory, and it will take more than a little time to make it forget Master Sergeant Roddie Edmonds. By standing German policy, Jewish POWs were to be separated from the rest of the POW population. By this time, the largest of the death camps in the western theater were no longer in business, so most of these POWs were taken away to slave labor camps where they were, with less efficiency but no less contempt for their humanity, worked to death. Speaking in English, the German camp commander – a Major Siegmann – approached the POWs of the 422nd. He ordered that all Jewish men were to fall out and stand in formation in front of the barracks, then went to await them. Whereupon Master Sergeant Roddie Edmonds ordered every man under his command to fall out and stand in formation in front of the barracks. “I would estimate that there were more than 1,000 Americans standing in wide formation in front of the barracks with Master Sergeant Roddie Edmonds standing in front, with several senior non-coms beside him, of which I was one,” recalls Lester Tanner, a Jewish member of the regiment. Siegmann drew his sidearm and held it to Edmonds’ head. Siegmann, having been (in the words of the Jerusalem Post) “outfaced by Edmonds,” turned and walked away. More than 200 of the prisoners were Jewish (all the time, that is, not just when Nazis were asking). Edmonds saved them all from near-certain death. Chris Edmonds knew his father had spent 100 days in captivity, but had no idea anything like this had happened until he read a newspaper story a couple years ago about Richard Nixon’s post-presidency search for a New York home. The article mentioned Tanner, who sold Nixon his house, and included the story about his father. Chris Edmonds began tracking down Tanner and other corroborating evidence, culminating in Master Sergeant Roddie Edmonds being named “righteous among the nations” by Yad Vashem last December. He is only the fifth American, and the first American serviceman, thus honored. Now, so do we all. OCPA’s latest Perspective carries my article reviewing evidence suggesting that, where parents are in charge of education, teachers are free to teach. The data come from a study of federal teacher surveys that I did with Christian D’Andrea in 2009, but they are of fresh interest in light of the recent crisis over accountability in education reform. On accountability, we found private school teachers were much more likely to say they have a great deal of influence on performance standards for students (40 percent versus 18 percent), curriculum (47 percent versus 22 percent), and discipline policy (25 percent versus 13 percent). They were also more likely to have a great deal of control over selection of textbooks and instructional materials (53 percent versus 32 percent) and content, topics, and skills to be taught (60 percent versus 36 percent). Shockingly, we found public school teachers were four times more likely than private school teachers to say student violence was a problem on at least a monthly basis (48 percent versus 12 percent). That means about half of public school teachers are being asked to work in an environment where violence is a regular problem. Nearly one in five public school teachers had been physically threatened by a student, compared to only one in 20 private school teachers (18 percent versus 5 percent). Nearly one in 10 public school teachers had been physically attacked by a student, three times the rate in private schools (9 percent versus 3 percent). Where student violence is a problem on some days, student disorder is a problem every day. Sure enough, we found public school teachers were much more likely to report that student misbehavior (37 percent versus 21 percent) or tardiness and class cutting (33 percent versus 17 percent) disrupt their classes. One in eight public school teachers reported that physical conflicts among students occurred every day; only one in 50 private school teachers said the same (12 percent versus 2 percent). How are teachers supposed to teach? Where parents are in charge, the school is free to be itself, and that cultivates a strong spirit. Private school teachers were much more likely to strongly agree that there is a great deal of cooperation between staff members (60 percent versus 41 percent), that their colleagues shared their values and understanding of the core mission of the school (63 percent versus 38 percent), and that their fellow teachers consistently enforced school rules (42 percent versus 29 percent). These intangible factors affect how schools manage their more material affairs. Private schools almost always have smaller budgets than public schools. Yet somehow private school teachers were more likely to strongly agree they had all the textbooks and supplies they needed (67 percent versus 41 percent). They were also more likely to strongly agree they got all the support they needed to teach special needs students (72 percent versus 64 percent). And although their class sizes were only moderately smaller, private school teachers were much more likely to strongly agree that they were satisfied with their class sizes (61 percent versus 34 percent). Sure enough, teachers who are accountable to parents are a lot happier than teachers who are accountable to government. Check it out and let me know what you think! A mixed victory for the unions, but it’s also a reminder of the problem built into the design of charter schools. Charters are, in the final analysis, government schools, and thus can never be more than a halfway house to real (i.e. private as well as public) school choice. It’s a thought that Common Core supporters would also do well to ponder. If you need to blink, do it now. If you miss a single word of the blog post below, our hero will perish. Do yourself the biggest favor you’ve done yourself in a long time and go see Kubo and the Two Strings while it’s still in theaters. This masterpiece demands to be seen on the big screen, so you can appreciate not only its oustanding story but its gorgeous visuals. If you know Coraline, you know what greatness the offbeat animation studio LAIKA is capable of. LAIKA’s last few offerings haven’t been as well recieved, but let me assure you Kubo not only matches but actually surpasses the storytelling and artistic accomplishments of Coraline. It would be criminal to reveal the plot of Kubo. Indeed, one of the many ways in which this movie shines is the perfect craftsmanship of its progressive plot revelations. These people know how to tell a truly epic story. Is it better to be a man, to live a life marred by suffering and then die, leaving behind deeds well done and the memories held by those who loved you? Or is it better to be the moon, floating high above the world and immune to death and suffering, and have no story? Don’t miss this gem. I’ll be going back as soon as I can to see it again. Update: Saw it again, loved it more the second time. “It amazes me that creatures down here will fight so hard, just to die another day.” “Down here there are days worth fighting for.” Don’t miss your chance to see it on the big screen! All this can be summed up by saying that teachers need to be wise and professional. Wisdom means teachers possess themselves the capacities of head, hands and heart that we want students to develop. Professionalism means that teachers’ primary motivation is not to check boxes on a curricular chart or maximize formal outcomes such as test scores, or even to please parents, but to help students develop those capacities of head, hands and heart that the teachers possess and the students need. Freedom and community tend to lose their meaning when separated from one another. Real community means people freely choose to be in community. And real freedom can only be protected by a community that loves freedom and institutionalizes it as a shared, public moral commitment. Next, in Part 3: how the two great camps in the debate over accountability – advocates of technocracy and choice – are, in different ways, trying unsuccessfully to sidestep the core problem of building consensus in a pluralistic society. Stay tuned! Your thoughts are very welcome as always. The Next Accountability: What Do We Want from Schools? Today the newly renamed EdChoice launches Part 1 of my series of articles on The Next Accoutability, previewed with an introduction a few weeks ago. The movement was well served in many ways by its various edifying impulses: to “close the achievement gap,” to “put parents in charge,” etc. But it has been haunted for decades by a growing awareness that these moral impulses do not always cohere easily. The question, “What do we do if putting parents in charge doesn’t, by itself, close the achievement gap?” has been debated at every education reform conference I’ve attended. Such debates were lively and interesting intellectual exercises, so long as not much hung on them. Our freedom to disagree about transcendent things does not mean that public policy can escape the responsibility to ask what is good, true and beautiful. In fact, the very assertion that it is good to have the freedom to disagree about transcendent things is itself an assertion about what is good, i.e. about transcendent things. School accountability should be grounded in an understanding of human potential aimed at building up free communities, open to pluralism under the rule of law and respect for human rights, where people achieve and appreciate the good, the true and the beautiful in the midst of their differences over those very things. I outline how we can understand educational goals for the head, the hands and the heart in ways that point toward the possibility of coherence in a pluralistic society. Coming in two weeks: Part 2, looking at how teachers and schools actually carry out the task of educating students in the midst of our uncertainty about the highest goals of education. It is here, I will contend, that we will find clues to how we can hold schools accountable more effectively. Stay tuned! As always, your comments and feedback are greatly appreciated.